Colds aren’t just for the dead of winter. According to Women’s Health America founder Marla Ahlgrimm, some cold viruses thrive in the heat and are ready and waiting to interrupt our summer vacations. Q: What is the difference between a “winter” cold and a “summer” cold? Marla Ahlgrimm: Cold weather sniffles are usually caused by a member of the rhinovirus family, which thrives in cool conditions. From about May through October, most colds are triggered by exposure to a non-polio enterovirus. Both are viral infections and present with similar symptoms, including runny or stuffy nose, low fever, coughing, and sore throat. Some enteroviruses may also develop into conjunctivitis, or pinkeye. Q: Who is most at-risk of catching a summer sickness? Marla Ahlgrimm: Most adults have built up immunities to the most common viral culprits. Children, however, are a different story. 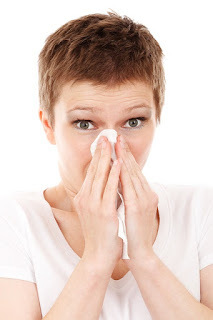 Colds spread quickly through daycare centers and other areas where there may be many children in close proximity, such as summertime vacation bible schools, museums, libraries, and playgrounds. Adults can also be caught in the cross fires of new strains, especially if their bodies are already weak from an underlying condition. Women may be exposed to cold viruses more often if they work in childcare over the summer months. Q: How can I prevent getting sick in the summer? Marla Ahlgrimm: Illness prevention is about blocking the transmission of the germs that cause the cold in the first place. It starts with hand washing and removing germs from hard surfaces. Stay away from sick people, if possible, and avoid touching public doorknobs and telephones. Marla Ahlgrimm: Not just yet! Fortunately, colds typically run their course within a few days, and without any serious complications for otherwise healthy men, women, and children. In the meantime, symptoms may be relieved by using an over-the-counter nasal decongestant, getting plenty of rest, and staying hydrated.